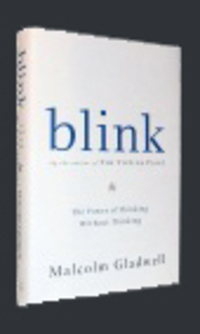 Since reading Malcom Gladwell’s book, ‘Blink’ I have become considerably more comfortable in my own ability to make the ‘correct’ decision as a ‘snap judgement’, instinctual response, emotional or anger, practical or in practical, right or wrong. It would seem for me anyway that my instinct has been proven right on many occasions which can only fill ‘me’ with more confidence about the ‘inner workings’ of ‘me’ as a person. This following study from University College of London, reinforces this understanding of the human mind. reliable than decisions taken using higher-level cognitive processes. than using our higher-level cognitive functions." they were given no scrutinizing time at all. higher-level cognition by, for example, acting quickly." Note: This story has been adapted from a news release issued by University College London.